It's a fact that, double is always better than single. Imagine, how it would be when two of your superheroes will join hand to bring down their enemies. I am not talking about supernatural movies. It's all about internet world. What is the Deal Between Twitter and Google? You can also scroll left to see more tweets and this is limited to maximum 8 tweets only. All older tweets will be trashed and latest one will be retrieved again. Google do this job within few seconds. It just fetch all stream of tweets from firehose. 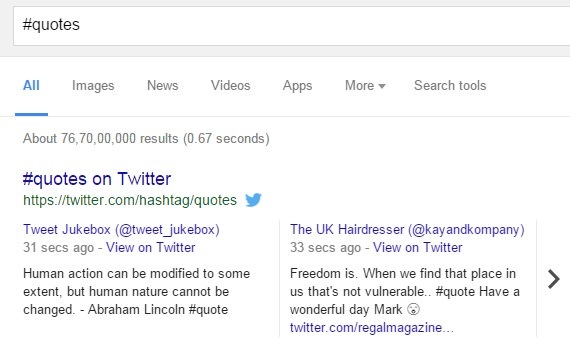 As soon as new tweets are posted, search result pages are updated instantly. Now lets see the example for hashtags. If I searched for "#Quotes" term in google, below results are displayed. See the time period is just 31 second which again shows that how fast googlebot is indexing these tweets. How This Partnership Is Beneficial For Google? For every successful online business, best user experience should be first priority and Google like companies understand this very well. 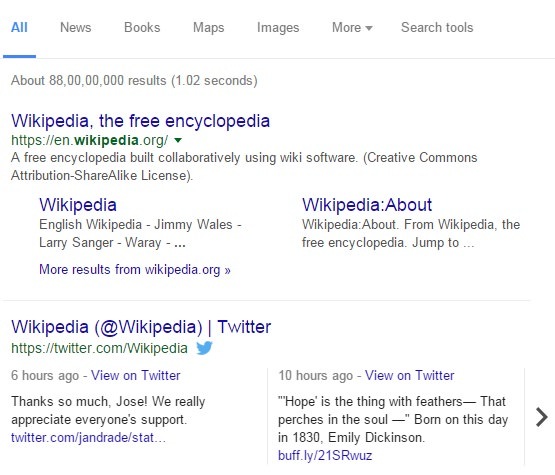 To make search results more accurate and fresh, these live tweets can be very helpful. This case holds good for news reports also. Search Engines keep record of all data retrieved from different sources. Now if I am searching for "earthquake", then it may display results from past few years but what for latest news? To make results more fresh and accurate, these live tweets from different twitter users are really important. Google can display latest news using them and this will help him to build better user experience. Although Google is number one search engine but to improve and dominate more market share, this partnership is very important for it. The tough competition with other search engines especially with Yahoo and Bing is getting hard day by day. But surely this deal will heal it all and people will find more trust with Google. Though I am not sure about it as there is no official statement from any of them but I think twitter had paid to Google. Otherwise it has other powerful alternatives like Facebook and G+. So why didn't they use them? What do you think? What Will Twitter Get In-Return ? It is twitter who will get ultimate profit from this partnership. No doubt, this deal has boosted it with advanced SEO and thus it will get a huge amount of organic traffic. People are more likely to read latest and fresh content instead of reading old one. The live tweets in search result pages will work as bait for them. Moreover overall look is very attractive and surely twitter will get more hits from google. From other view, this will help him to build better user interface and thus it will get more trusted users. 2. More Ad Clicks, More Money! This is the most interesting and even unseen part of this deal. Apart from huge traffic, twitter will get a huge amount of money also. You may be wondering about how is it possible? Well we all know that anyone can advertise or campaign on twitter with affordable prices and these ads are displayed each time whenever users visit their page. Now if I searched for something on Google and moved to Twitter webpage, then it will display ads to me, ultimately Twitter will be paid for this. Moreover as traffic will increase, more people will find interest in to advertise on Twitter and it will be then better alternative to Google AdWords, Facebook Ads and other advertising networks. The only Social Media Website which can stand around Facebook is Twitter and no doubt, it is tough competitor for it. From research and studies, its been found that Facebook has more than 50% market share worldwide and this position is stable from past few years. Now let me ask you one question. How many percent of your friends and family member use Facebook and how many of them use Twitter as their primary choice? I think you already know the answer and your most percent lies on Facebook. But let me tell you that maybe you're not having a friend who is professional, online marketer or blogger and this is what matters. From this partnership, marketers, web-developers, bloggers and even celebrities will find more interest to use their twitter account instead of Facebook. According to me, the normal population will continue to use Facebook as it is good for them but this will affect other people interest. Overall chances are, Facebook may lose some traffic, trusted users and thus market share. Ultimately this will bring more tough competition for it. From other point of view, Facebook will also lose some organic traffic from Google. We also know that Facebook is most active social media website and it would be better to deal with it. Then why did Google choose twitter only? Do you have any idea. Well I don't know what happened inside but surely this decision will reduce some Facebook reputation. Don't you think so? 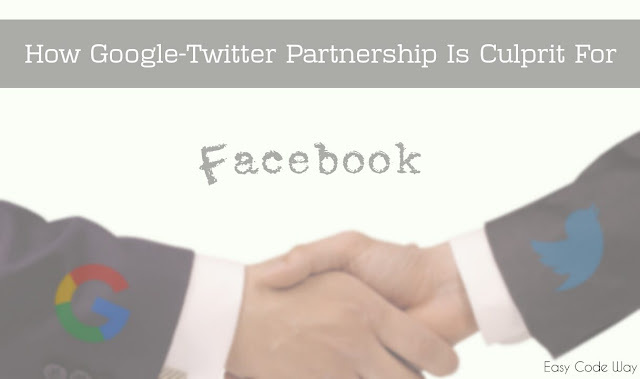 So these are some of my personal views on Google-Twitter Partnership and few of which are truly assumptions. Now let's see what will happen in this upcoming year and how it will affect other social media websites. I will share more interesting reports very soon. If you have any point of discussion in this topic or if you think I am wrong somewhere, please comment below and start discussion now.